Have you ever tried to draw while traveling with non-drawers ? Do you feel like you're disturbing them while drawing ? Did you get frustrated of not fulfilling your sketchbook during your trip ? Then this class is for you. 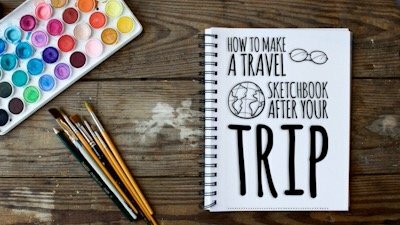 In this Skillshare class you will learn how to make a travel sketchbook once you're back home. In this 40 mn class we'll cover all topics from writing a roadmap of your trip, collecting images, choosing your layout, tools and materials, drawing, inking and adding watercolor. We will discuss about frontpage and cover as well. This class is meant for intermediate and advanced levels as it assumes you have basic skills of sketching and watercolor. I used watercolor in my sketchbook but you can use whatever medium you like: colored pencils, gouache, acrylic painting, crosshatching. Your project will be to create a travel sketchbook about a short trip you made : holidays, visiting friends or family, business trip. You'll have a sketchbook filled with memories that you will treasure for a long time.